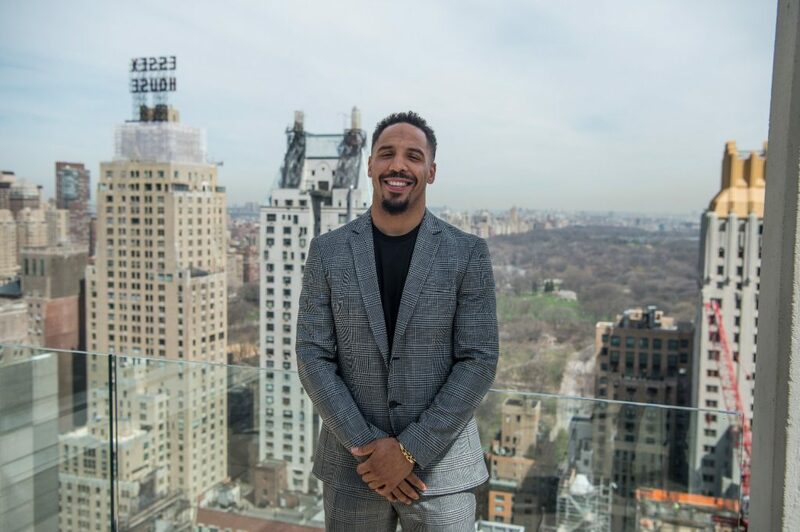 NEW YORK, NY – Roc Nation Sports, Main Events, Andre Ward Promotions and Krusher Promotions are pleased to announce the highly anticipated rematch between the unified Light Heavyweight Champion of the World, Andre “SOG” Ward (31-0, 15 KOs) and former title holder Sergey “Krusher” Kovalev (30-1-1, 26 KOs). 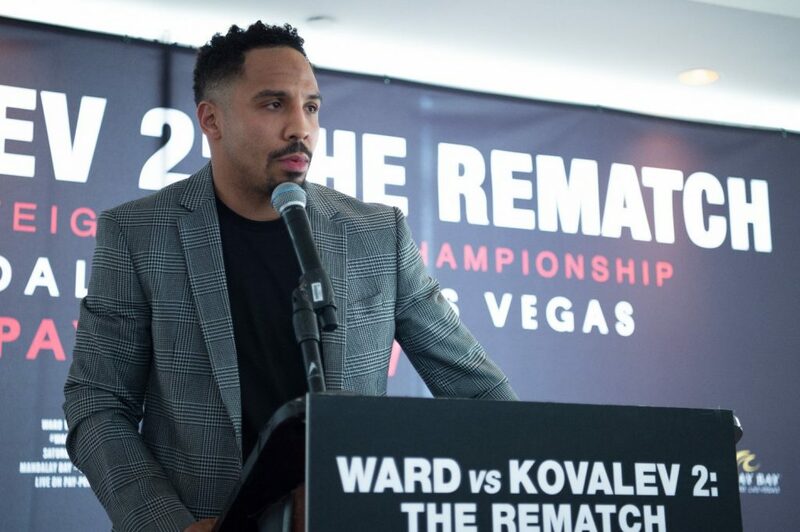 Ward vs. Kovalev II “No Excuses” will take place Saturday, June 17 at the Mandalay Bay Events Center in Las Vegas. 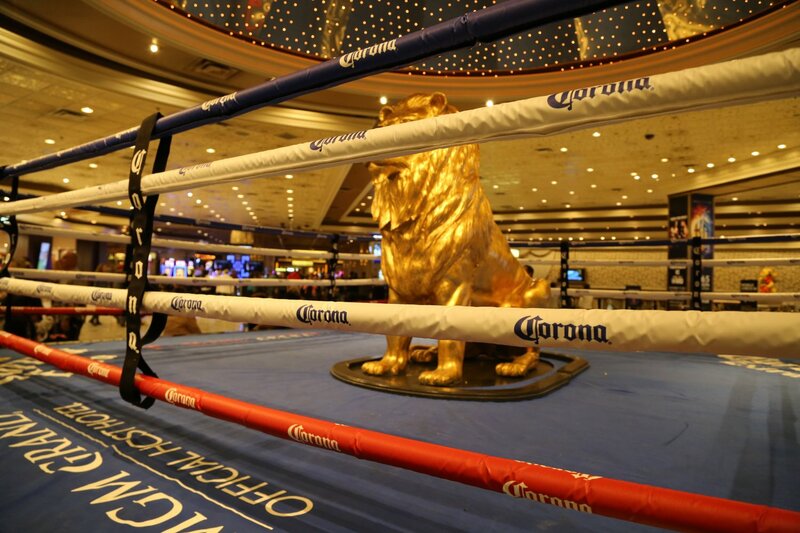 The championship event, presented by Corona Extra, will be produced and distributed live by HBO Pay-Per-View beginning at 9:00 p.m. ET/6:00 p.m. PT. 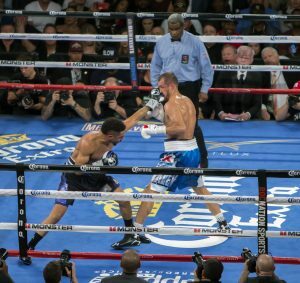 Posted on April 6, 2017 April 6, 2017 Author DaveCategories Fight UpdatesTags #wardkovalev #kovalevward1 Comment on The Rematch is on! 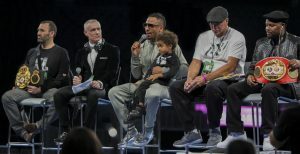 The intensity of the Ward-Kovalev weigh-in and stare down was so palpable that the fighters had to be separated. 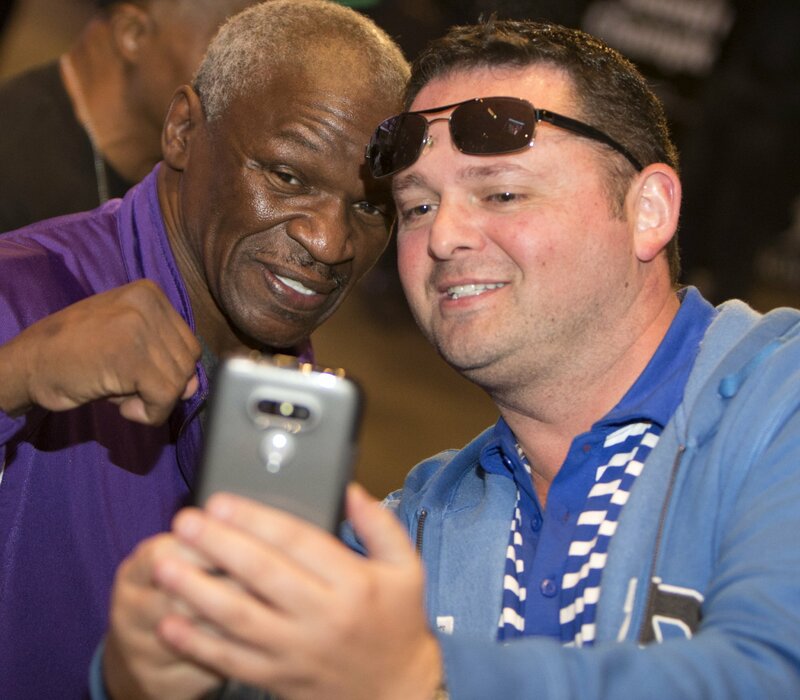 Lamar Austin and takes a selfie with an unidentified fan. 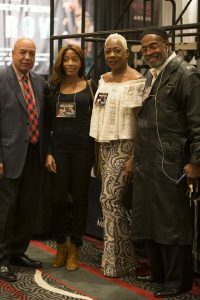 “The Heavy Hitting Diva” and eight time national champion Franchon Crews (l) faced two time Olympic gold medalist Claressa Shields (r) Ms. Sheilds, both in their professional debuts. 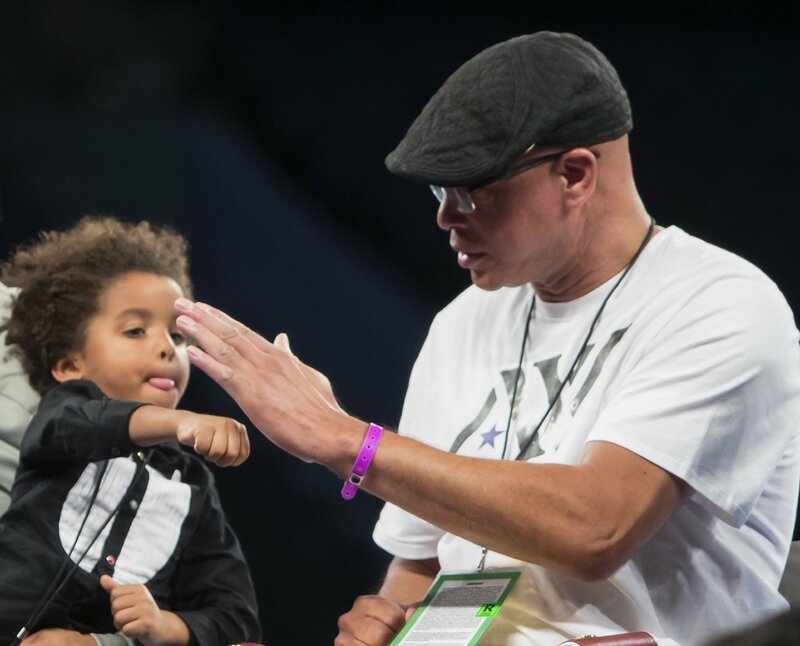 The bout is the second in history to grace a ROC Nation fight card. The historic first time, Raquel Miller (2-0. 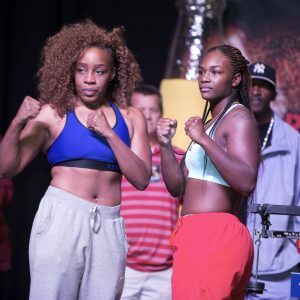 1 KO) defeated Sara Flores (0 – 1) on the Ward v Brand under card. 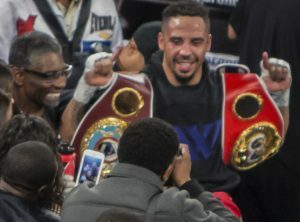 Andre Ward (31 – 0, 26 KOs) is the new International Boxing Federation (IBF) World Boxing Association (WBA) and World Boxing Organization (WBO) light heavyweight champion of the world! From left to right – Josh Dubin, Andre Ward’s attorney holds his WBO title belt, ROC Nation president Michael Yormark, Andre Ward holding his son Micah, AKA “Champ”, Andre Ward’s Trainer Virgil Hunter holding the the WBA title belt, and Manager James Prince holding the IBF belt. 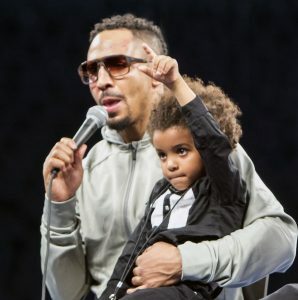 A victorious Andre Ward holds his son Micah, (AKA “Champ”) who shows the world his dad is number #1! Andre Ward defeated Sergey Kovalev at the T-Mobile arena tonight, November 19th, 2016. In our opinion this was Andre’s most exciting and challenging fight. Nice crowd tonight, fans are excited. Andre comes into the arena first. Both fighters look good. 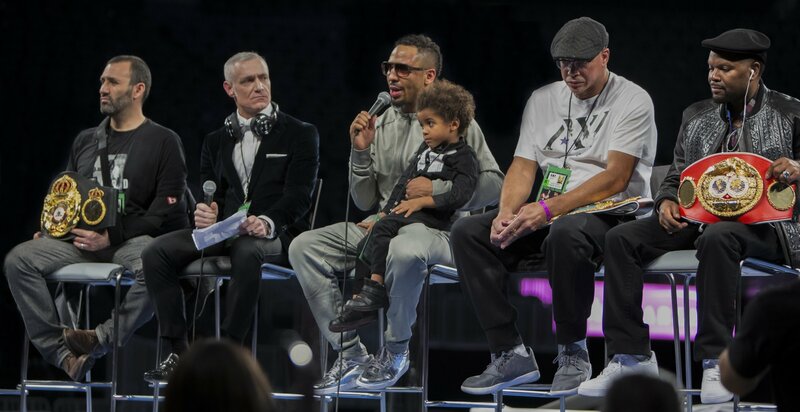 Andre looks a bit lighter. Both fighters are 6′. The big screen above the ring shows Andre doing a muscleman pose; chest and arms look great. 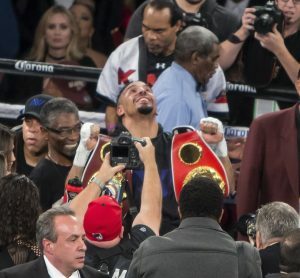 That was the first time I ever saw Andre do that, but he ‘is’ a Light Heavyweight now. 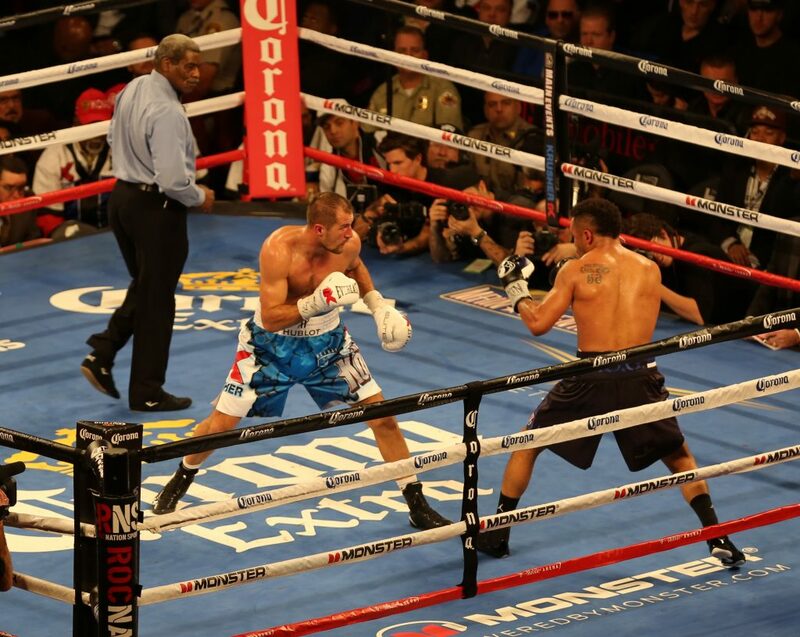 Round 1: Kovalev throws the first punch of the fight; nothing to it. 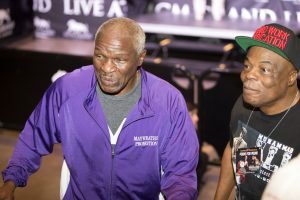 Both boxers do not feel each other out much, soon go right to fighting. Andre works his jab. 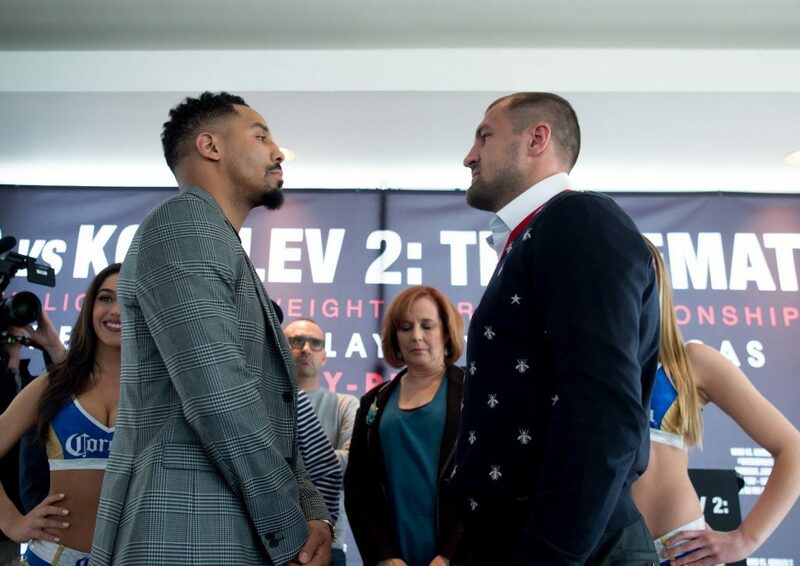 They both trade right hand punches and then Kovalev connects with a couple of good jabs. Sergey follows with a one two that backs up Andre. Kovalev looking much Better than Andre. 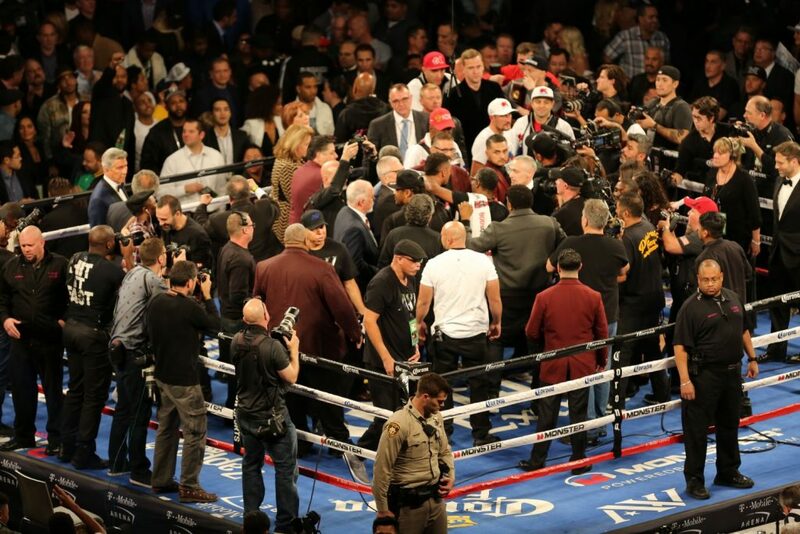 Round 1 to Kovalev. Round 2: opens with Andre throwing several nice jabs. 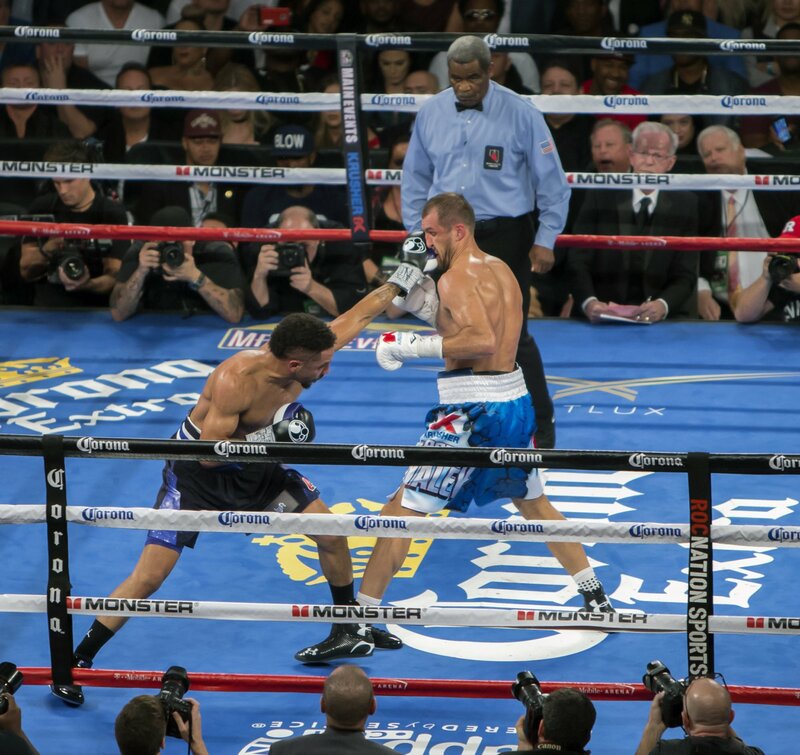 Kovalev then gets a left and a hard right. 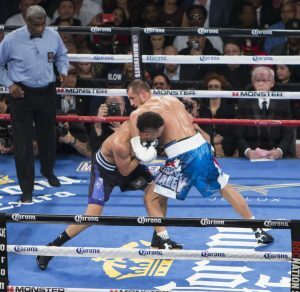 He moves forward and hits Andre with a right that knocks Andre down. Right hand punches get to Andre. Is it time to worry? I worry. 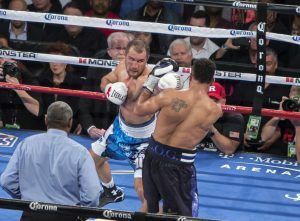 A good score for Kovalev. 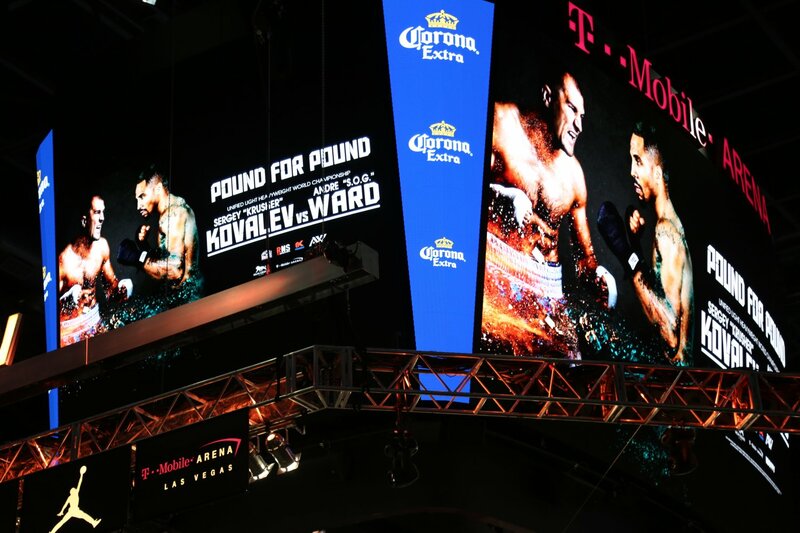 Just into Round 3: Ward ties up Kovalev with a tackle, both boxers get a warning by the ref. Andre connects with a good jab, Sergey punches, backing up Ward. A clinch and some feinting closes the round. 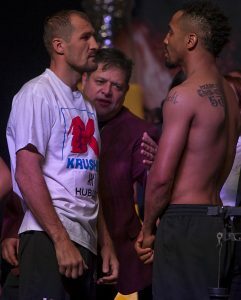 Kovalev looks the better fighter. I give another round to Sergey. Will this be Andre’s first loss? 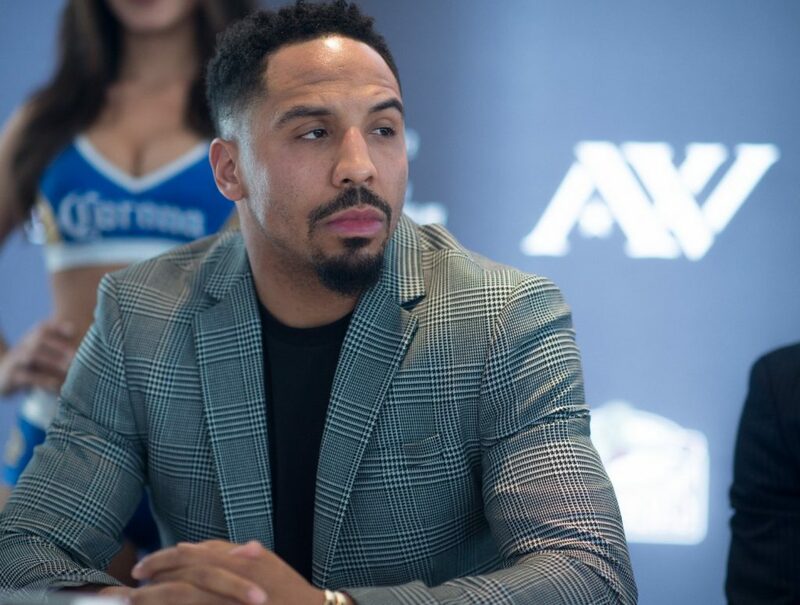 This ‘is’ only Andre’s second fight as a pro at Light Heavyweight. Round 4: opens with some nice jabbing by Andre. 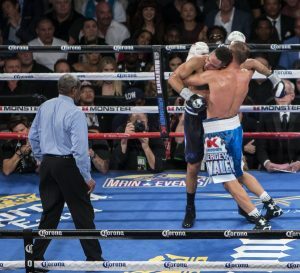 Kovalev is not as aggressive this round, but he still connects cleanly, landing several hard. There’s good action by both boxers. Andre a bit more defensive. I’m calling it Even. 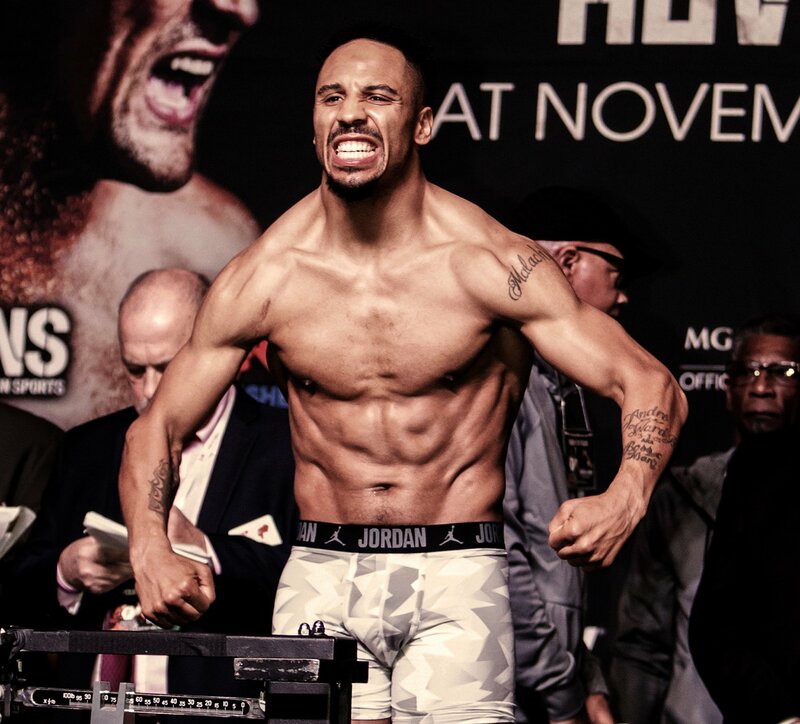 Andre is dancing around Kovalev this Round 5. He continues to use his jab while Sergey works the stomach. 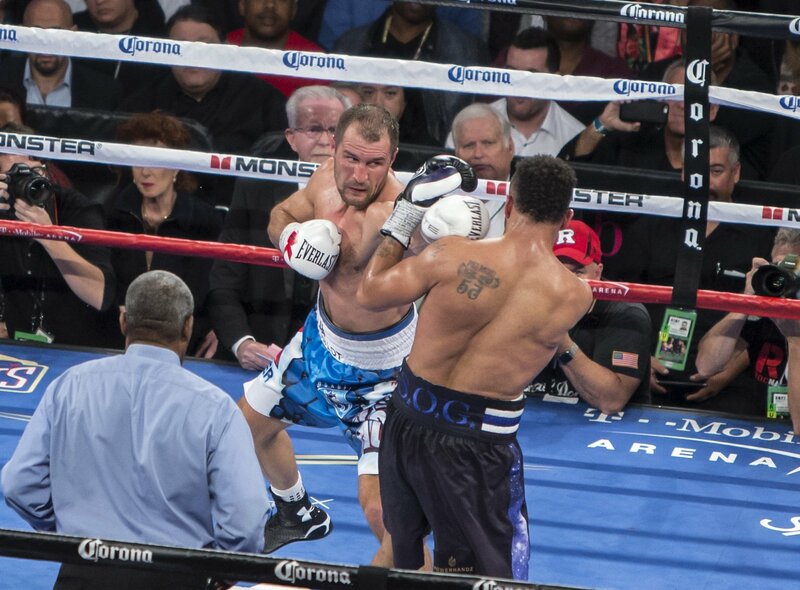 Andre lands a good body punch and after a jab he lands a right punch that make Kovalev feel it. Ward avoids a right. Andre takes this round; his first of the night that I give him. This Round 6: Andre is looking better than the earlier ones. There are fewer punches thrown in the round. 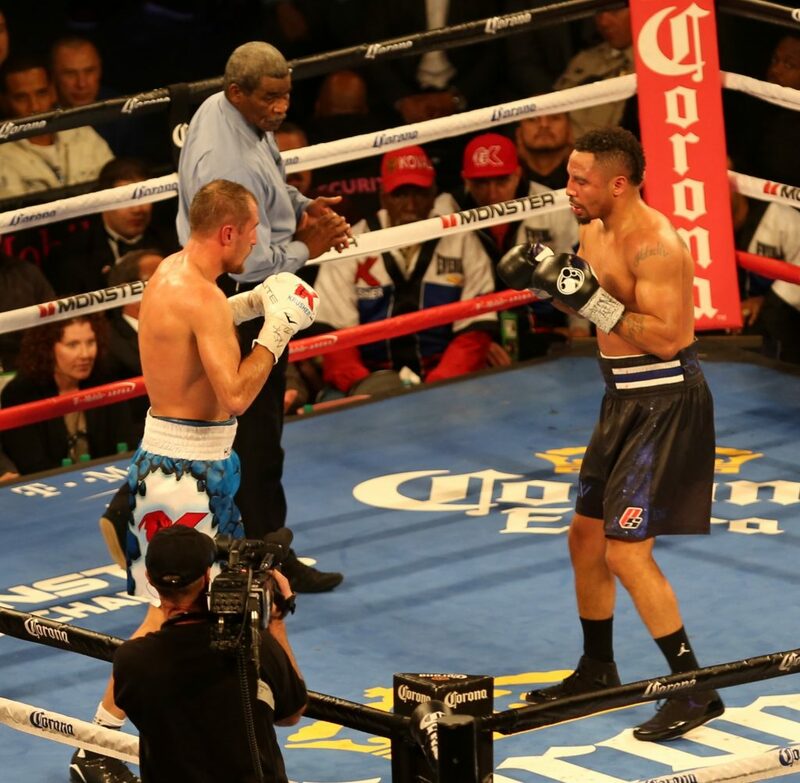 Kovalev lands several rights, Ward a nice body shot. Andre continues jabbing away. Call the round Even. Round 7: has Andre getting 3 head jabs in a row, but Sergey is ok. 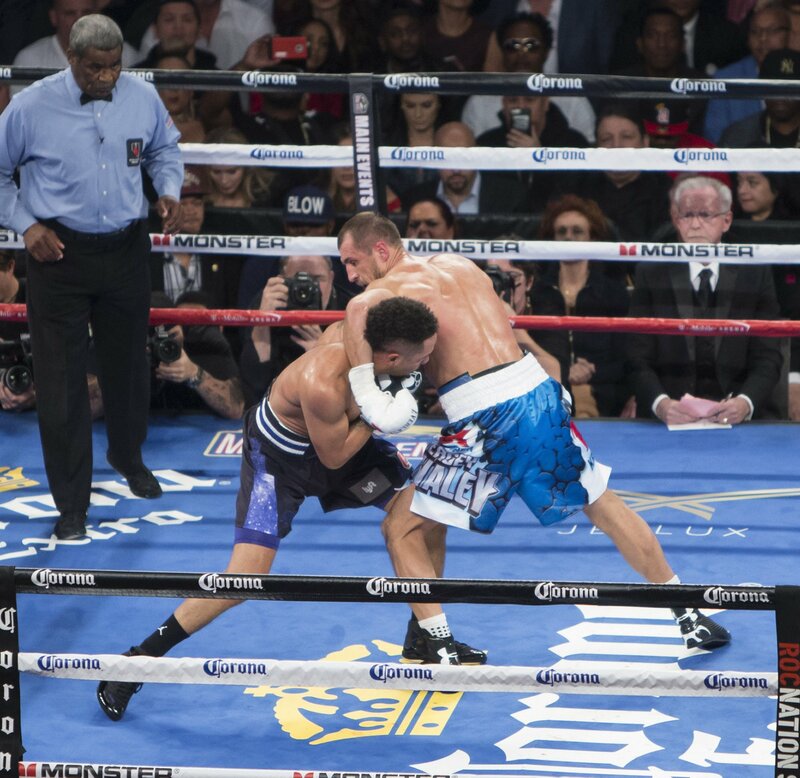 The fighters trade a couple of good ones and at the end trade a left jab by Kovalev and a right by Ward. 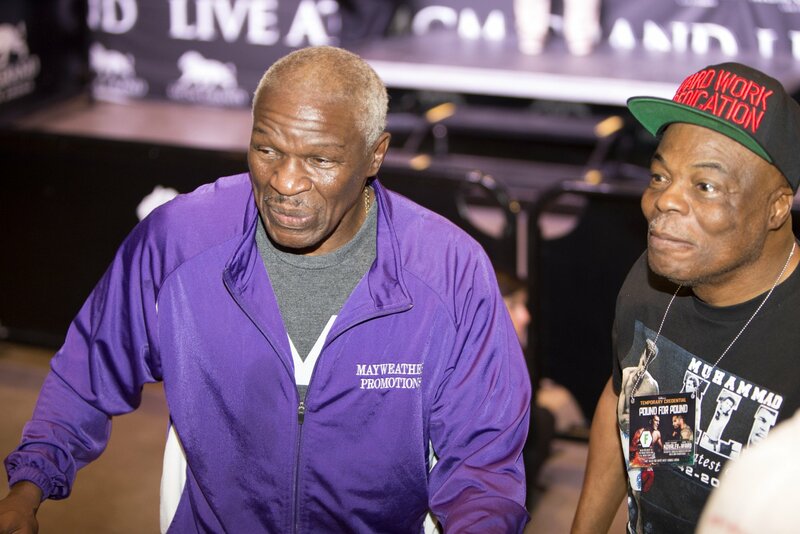 Andre is moving and boxing better and I give the round to Andre. 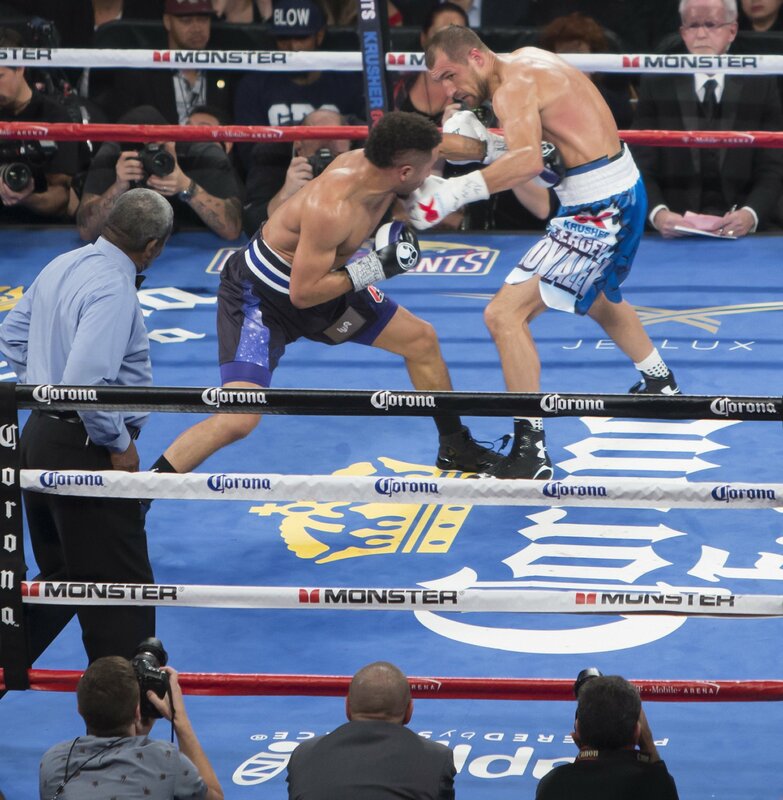 Round 9 has Andre showing more of his boxing skills; starting to outbox Kovalev. Sergey connects with a combination. Ward is working on the body more, but also lands some sharp rights. 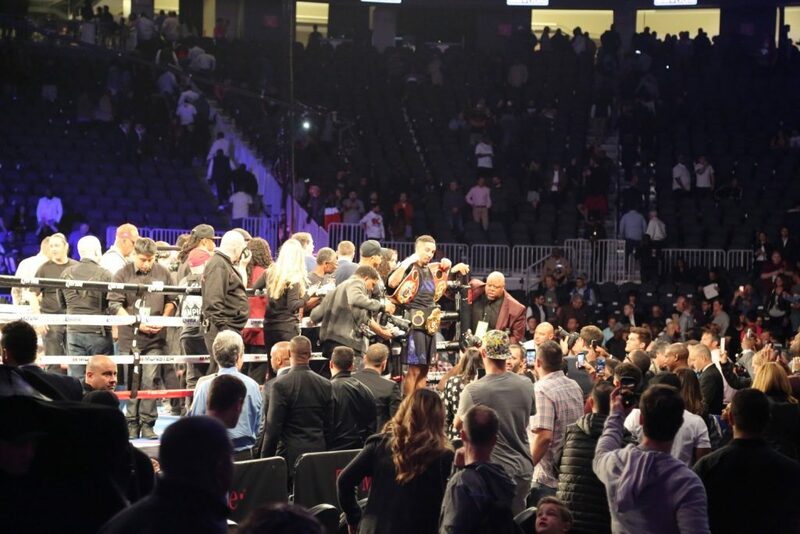 Kovalev bangs another combo and Andre taking punches fine. Andre wins another round. The fighters are trading some decent punches here in Round 10, going back and forth, both landing counter punches. 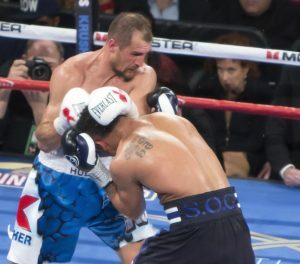 Kovalev looks like he is bleeding a little over his left eye. Andre is carrying his left down, without worry of Sergey. More punches by Andre are landing. Andre wins round and is winning the second half of this fight. 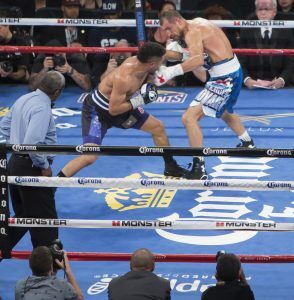 Round 11: opens with a hard left that moves Kovalev back. 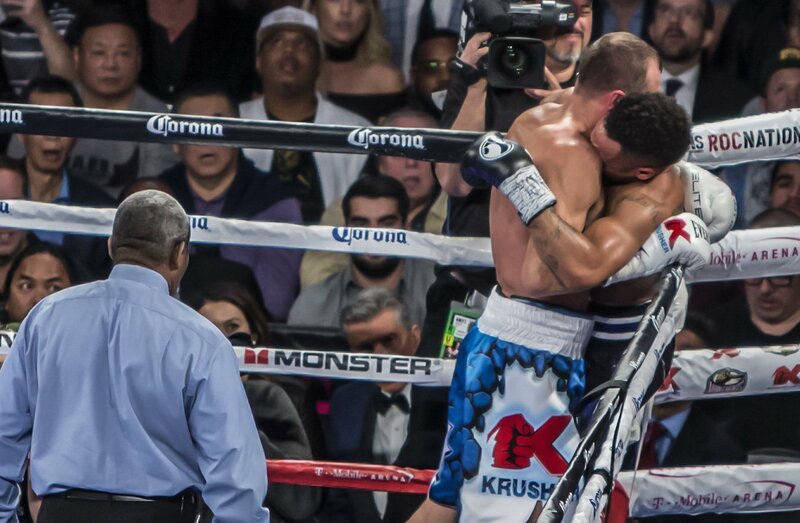 After a couple of jabs Kovalev puts a hard right to Andre’s jaw. 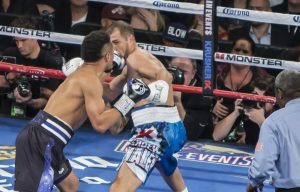 Some more jabs and Ward connects a left to Kovalev’s jaw. 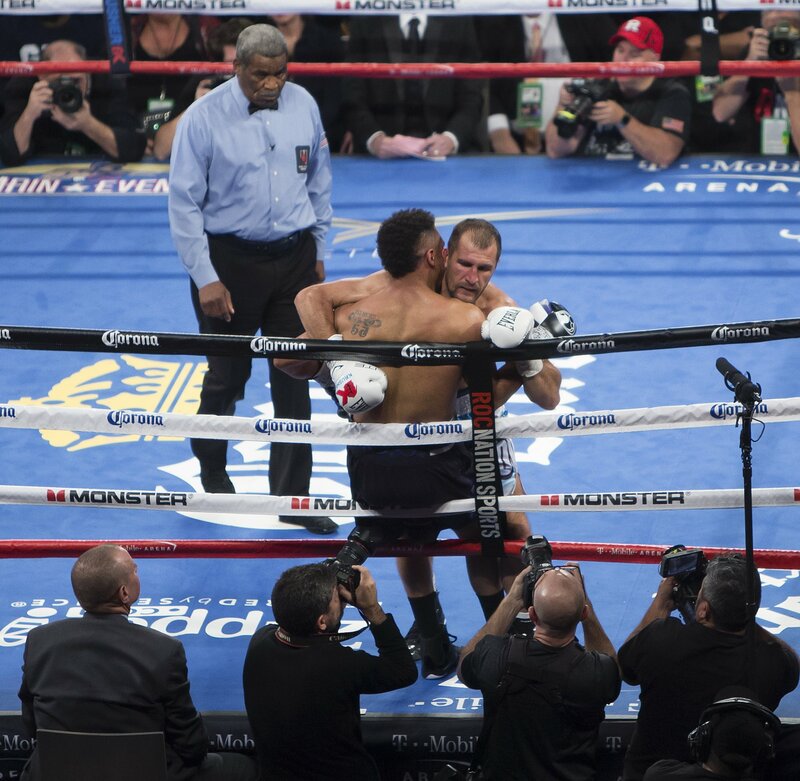 Kovalev goes to the canvas with a push. Andre get a warning. Ward gets the round. All three judges scored it 114-113 for Ward. I would have not been surprised if it went the other way. 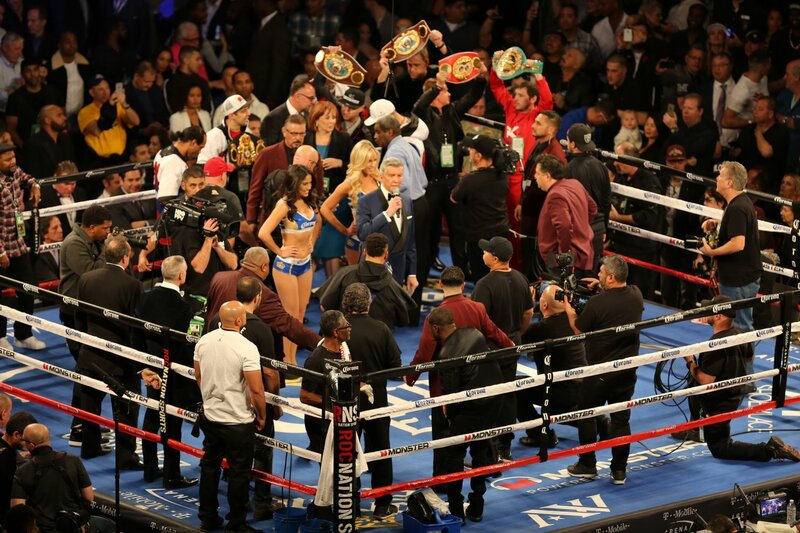 It was a great fight and exciting. It was close. “What a beautiful thing! We did it baby! It’s a lot of hardware. Surreal! This is what I set out to do. Now I’m a 5X World Champion in 2 weight classes. Man, it’s amazing! “I thought I won and it sounded like fair scoring. “Your last fight is always the most important. But I needed this. “It was about those in the trenches moments. Sergey has no inside game. So my mid-range and inside game is what I focused on. 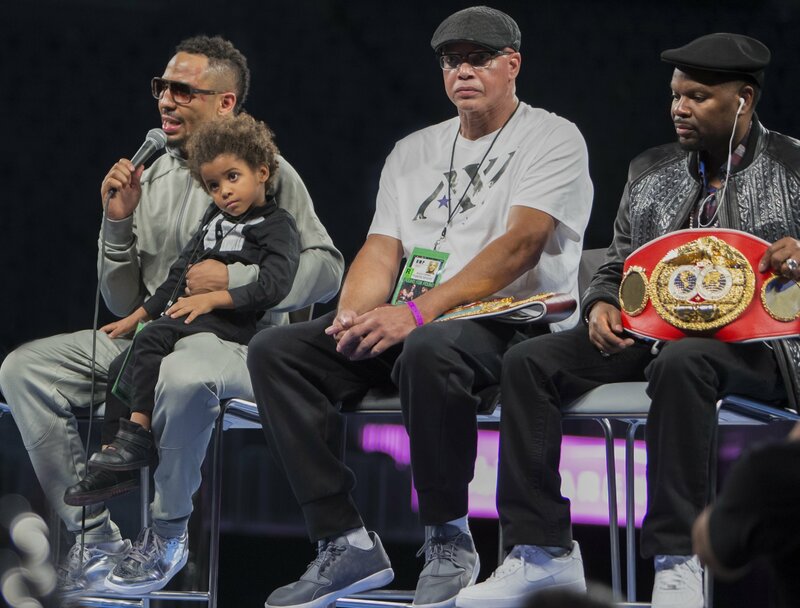 “After that second round knockdown, I think he (Kovalev) realized I wasn’t going anywhere and I was stepping on the gas. “The new light heavyweight champion. That sounds good! This was my most important and satisfying win. 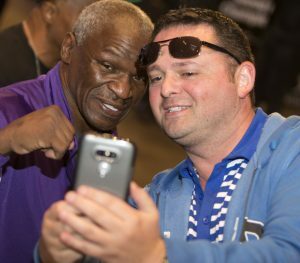 Posted on November 20, 2016 December 10, 2016 Author DaveCategories Fight UpdatesLeave a comment on Ward Delivers in Vegas!